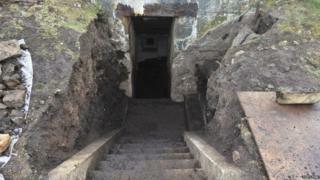 A World War Two bunker in Jersey will be opened up to the public for the first time since it was filled in more than half a century ago. Tonnes of earth and rubble have been excavated by hand from the bunker at Les Landes Common by the Channel Islands Occupation Society (CIOS). The former anti-aircraft gun station still has German artwork inside. It could feature as part of a guided history walk planned for 9 May, to mark Jersey's Liberation Day. The Channel Islands were the only part of the British Isles to be occupied during the war, remaining under German control for five years until they were liberated in May 1945. The CIOS was given permission to carry out the work by the States of Jersey Environment Department. The group said the islands were fortified "out of all proportion to their strategic value" because Hitler believed the Allies might attempt to regain the islands. It resulted in hundreds of concrete, reinforced bunkers, gun stations, anti-tank walls and tunnels being constructed for an invasion that never came. The bunker at Les Landes Common would have been manned 24 hours a day. Volunteers have removed about 15 tonnes of earth and rubble from the bunker, which Tony Pike from the CIOS says was filled in by the government "partly for safety reasons and partly to have it buried and forgotten". "After the war the States tried to destroy the fortifications," he said. "They were considered a nuisance and not regarded as of historical importance, but it was too expensive, so bunkers were filled with rubble and waste." Mr Pike said he hopes the excavation will be completed in time for it to feature in the history walk he is planning next month.